Share in Genel Energy closed Thursday up 2.75% after the company announced an update on activity at the Taq Taq field (Genel 44% working interest), as testing of the TT-20z well has now been completed. In a statement, the company said the well has entered production at an initial rate of 2,000 bopd with a 24/64″ choke, and this figure is expected to rise. 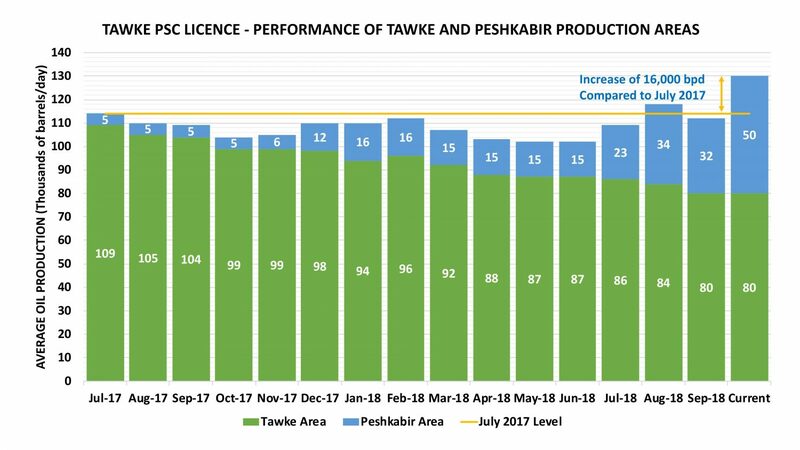 With the inclusion of this production, gross production from the Taq Taq field is currently c.15,500 bopd, with Genel’s overall net production now c.39,000 bopd. The well flowed oil from all three zones tested, with a maximum combined flow rate of c.4,000 bopd with a 40/64″ choke. Posted in featured, Genel Energy, Iraq Oil & Gas News, Iraq Oil Production News, Kurdistan News, mn, Taq Taq. Genel Energy has announced the appointment of Dr. Bill Higgs as Chief Executive Officer, and as a member of the Board of Directors, with immediate effect. Esa Ikaheimonen, Chief Financial Officer, has also been appointed to the Board. Dr. Higgs joined Genel as Chief Operating Officer in October 2017, and has since led on the delivery and expansion of our Kurdistan Region of Iraq oil business. Having 30 years of global exploration, development and operations experience, Bill is a qualified geologist with extensive expertise in all engineering and other technical and commercial aspects of hydrocarbon development and production. Murat Özgül will not stand for re-election at the Annual General Meeting, and has stepped down from the Board with immediate effect. Murat has taken up a transitional role as Special Adviser to the Board. He will remain with the Company until early 2020 to support key strategic initiatives, notably the progression of plans for the development of the Bina Bawi licence, where negotiations with the Kurdistan Regional Government (‘KRG’) are continuing. Mr. Özgül became CEO of Genel in July 2015, at a challenging time in both the oil industry as a whole and in the regional political situation. The Company had net debt of c.$220 million and was owed a net trade receivable with the KRG of c.$378 million. Regular payments for oil exports began shortly thereafter, and the Receivable Settlement Agreement (‘RSA’) was signed in August 2017. The RSA and continuing monthly payments have transformed the Company and its financial position. As at 28 February 2019, Genel had a net cash position of $81 million. “Murat has made an invaluable contribution to the development of Genel. He was integral to the signing of the Receivable Settlement Agreement, which transformed the Company’s financial prospects, and we look forward to continue working with him as we progress the Bina Bawi licence. In accordance with Listing Rule 9.6.13(1) the Company confirms that Dr. Higgs is currently a director of San Leon Energy plc and between August 2014 and July 2017 was a director of Ophir Energy plc. Esa Ikaheimonen is currently a director of Independent Oil & Gas PLC, between February 2016 and August 2018 was a director of Vantage Drilling International, was Chairman of Transocean Partners plc from April 2014 to June 2015, and non-executive director of Ahlstrom plc from April 2011 to April 2015. There is no other information required to the disclosed under Listing Rule 9.6.13R(2) to 9.613(6) inclusive. Posted in Business, featured, Genel Energy, Iraq Oil & Gas News, mn. Genel Energy has announced that, at the bondholder meeting held today, the Company’s proposal was adopted and the waiver of the dividend restriction in 2019 has been confirmed. With respect to the 2018 financial year, a year in which free cash flow totalled $164 million, the Board has accordingly recommended a final dividend of 10¢ per share, a total distribution of $27.9 million. As previously stated, given the strong free cash flow forecast of the business even after investment in growth opportunities, the Company intends to pay a minimum dividend of $40 million per annum. This will be split between an interim and final dividend, to be paid one-third/two-thirds. The final dividend reflects this split and will be subject to shareholder approval at the AGM on 16 May 2019. Genel intends to announce an interim dividend of 5¢ per share as part of the 2019 half-year results, which are scheduled for 6 August 2019. Posted in Business, Citi, Citigroup, featured, Genel Energy, Iraq Oil & Gas News, mn. Shares in Genel Energy were trading down four percent on Wednesday morning after the company announced its audited results for the year ended 31 December 2018, in which it wrote down its Miran asset by $424 million. Despite this, Genel says it can now initiate “a material and sustainable dividend policy“, with payments starting in 2020. The company’s shares are up 17 percent since the start of the year. “Genel’s strategy at the start of 2018 was clear – generate material free cash flow from producing assets, build and invest in a rich funnel of transformational development opportunities, and return capital to shareholders at the appropriate time. We are delivering on this strategy. More details – 40 pages of them! – here. Posted in Bina Bawi, Business, Dinar, Dinar Daddy, Dinar Guru, Dinar Recaps, Dinar Vets, featured, Genel Energy, Iraq Oil & Gas News, Kurdistan News, Miran, mn, Qara Dagh, Sarta. Genel Energy has announced that approval has been given by the Kurdistan Regional Government (KRG) regarding the acquisition of stakes from Chevron in the Sarta and Qara Dagh (pictured) blocks, in the Kurdistan Region of Iraq. According to a statement from the company, the acquisitions have now closed and Genel therefore has 30% equity in the Sarta PSC, with Chevron holding 50% and the KRG the remaining 20%. Final investment decision relating to Sarta phase 1A development has now been taken. Phase 1A begins with two wells, recompleting the Sarta-2 well and placing the Sarta-3 well on production, both of which flowed approximately 7,500 bopd on test, and the construction of a central processing facility with a 20,000 bopd capacity. Another well is expected to follow within twelve months of first oil, and further production capacity will be added as the field is developed and production ramps up. First oil is expected in 2020, with a total cost to Genel estimated at $60 million to the end of 2020. Genel has booked an initial 10 MMbbls of net 2P reserves relating solely to this preliminary phase of the project. Unrisked gross mid case resources relating to the Mus-Adaiyah reservoir only are estimated by Genel at c.150 MMbbls, with overall unrisked gross P50 resources currently estimated by the Company at c.500 MMbbls. Genel now holds 40% equity in the Qara Dagh PSC and is the operator, with Chevron holding 40% and the KRG the remaining 20%. Work is underway on assessing the optimal location for the Qara Dagh-2 well, which is set to be drilled in 2020. Unrisked gross mean resources at Qara Dagh are currently estimated by Genel at c.200 MMbbls. Shares in Genel Energy have risen 9 percent over the past 24 hours. Posted in Chevron, featured, Genel Energy, Iraq Oil & Gas News, KRG, Kurdistan News, mn, Qara Dagh, Sarta. Genel Energy has announced that McDaniel and Associates (‘McDaniel’) has completed the competent person’s report (‘CPR’) relating to the oil reserves at Taq Taq as at 31 December 2018. The Company expects to announce CPR reports for other assets in the portfolio prior to the announcement of full-year results on 20 March 2019. Posted in Business, featured, Genel Energy, Iraq Oil & Gas News, Kurdistan News, McDaniel & Associates, oil reserves, Taq Taq. Posted in featured, Genel Energy, Iraq Oil & Gas News, Iraq Oil Production News, Kurdistan News, Taq Taq. Genel Energy has issued the following trading and operations update in advance of the Company’s full-year 2018 results, which are scheduled for release on 20 March 2019. The information contained herein has not been audited and may be subject to further review. “2018 was a very positive year for Genel, which saw us generate material free cash flow and further transform the balance sheet. An expected year-on-year increase in production means we are set to continue this performance in 2019, with low-cost assets forecast to generate over $100 million in free cash flow even if the oil price averages $45/bbl. Posted in Business, featured, Genel Energy, Iraq Oil & Gas News, Iraq Oil Production News, Kurdistan News.